[ARCHIVED THREAD] - Your preference: 30 or 40 round mags? Which do you guys prefer and why? If you tape two mags together, are two 40 rounders somewhat cumbersome? I like them both, but I have twice as many 40's as 30's. I think the 30 round mag is perfect. 20 shot magazines are best, if you shoot from the prone position a lot. I honestly like the 20's better than any of them. A 40 round mag is a bit unwieldy in my experience and costs more than it is worth. I love 40's but they are too expensive. I have 40s and 75 rd drums. In a prepped position I'd go with the drums, then the 40s, then the 30s, then the 20s. But when out "for a walk", I'll take the 30s. 40's are only good because they take 2 boxes of ammo. i have to say the 30's only because i have yet to use a 20 round mag and 10 rounders are just too small and the 40 rounder hits my foward pistol grip when inserting and removing the mag( has to be done at an angle). 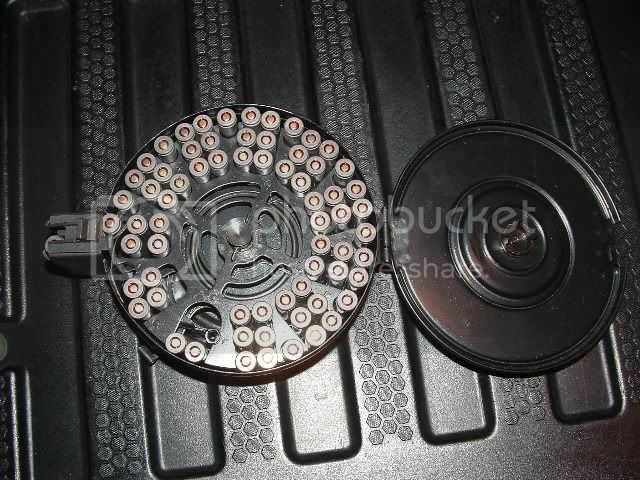 that being said if ammo wasnt getting expensive i love my romy 75 round drum. I have a load of 30`s and I have two 40rd mags clamped together. That being said if you`re not just hosing you`re better off with the 30`s. I prefer the 20s. They stick out less and the rifle balances better. They also don't cause the rifle to monopod when shooting from the bench. I have a lot of 20s and 30s but not 40s. But I also have one Romy 75 round drum, just because. +1. now if i could just get Ohio to let me USE them legally! Thanks for all the replies. Where can you find the drums?